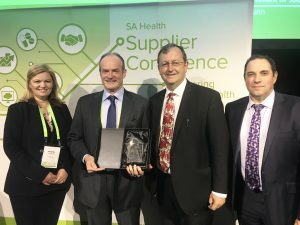 On Friday 26 October, ASC Training & Development was honoured to be awarded the ‘2018 SME Supplier Award’ at the SA Health Supplier Conference in Adelaide. The SA Health Supplier Awards recognise suppliers who achieve the high performance standards necessary to assist SA Health in providing healthcare to all South Australians. “ASC Training & Development is honoured to be named as the SME Supplier for 2018”, says Tony Stone, Managing Director. Established in 1996, ASC Training & Development has engaged with public and private organisations to help in the development of their people through targeted, relevant training. We provide both Nationally Recognised Training Qualifications and bespoke Corporate Training. As a team we bring complementary skills, expertise and passion for excellence in both customer service and training outcomes.